This is a superb kit for the complete home setup, with everything you need to bring Freesat to your TV. 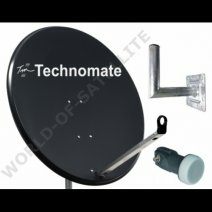 The kit comprises a high quality, high gain, 80cm steel satellite dish with brackets and fixings to enable wall or pole mounting, a 20m satellite cable to bring the signal from the dish to the receiver. To assist in the initial setting-up of the kit, we also provide a satfinder meter which will help you find the optimum dish setting. As well as being ideal for the main UK satellite, Astra 28E, this kit can be used for many Eastern and Western European satellites, including Hotbird, Astra 19E, Astra 23E, Polsat, Eutelsat, Sirius 2, Intelsat, Hispasat, Telstar 12Wand Atlantic Bird 3. This is not an exhaustive list and depends on your exact location. It is also ideal for motorised setups for receiving signals from multiple satellites. @Surveillance911 @AbraxasSpa its not as portable as it looks. It requires a pretty good size dish to uplink with a satellite.